"Decision 2010", "Employee Intimidation", "McDonald's", "Voter Intimidation", "right wing thug"
You will recognize that down the line, these are all GOP candidates. It makes you wonder just what the "raises and benefits" at their "current rates" actually are. Have a whole lot of McDonald's employees in Canton, Ohio suddenly been getting rich thanks to their employer's magnanimity? For some reason, I can't seem to find that story anywhere in the news. Not even on Fox News. 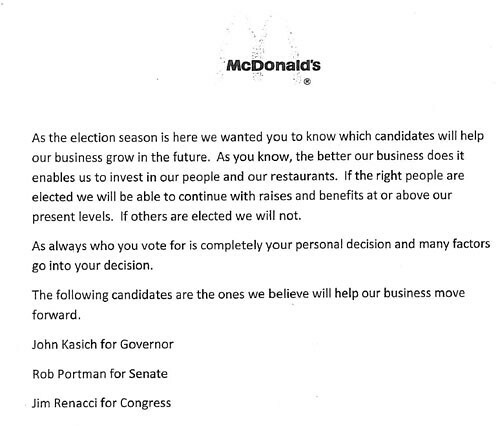 And oh, should the Republicans win, is the franchise owner willing to guarantee in writing to each of their employees just what they said in the letter? But it's not just that the McDonald's franchise owner's idea of policy is entirely and absolutely disconnected from reality. This is voter intimidation. This is threatening an employee with his or her job -- that is to say his or her livelihood -- if he or she doesn't vote in a way amenable to the employer's will. This is corporate thuggery coming to a employer near you and sneaking into a voting booth near you. This is an assault on our democracy, and it is profoundly Un-American. The utter moral bankruptcy of such a note compounds, as Think Progress indicates, as the new health reform law will help this very McDonald's provide health care to their employees, and for their employees to be able to get affordable coverage. It's the same health reform law that, by the way, all three Republican candidates the owners are trying to coerce their employees into voting for oppose. The owner of the franchise, Paul Siegfried, when caught, apologized for a "error in judgment" and only to those he offended. Mr. Siegfried, you didn't simply "offend" people. The first apology is not owed to those who caught you red handed. It is owed to those you tried to intimidate and coerce into voting for your personal choices. You owe an apology, first and foremost, to your employees. Then, you need to give all of your employees the day off on election day, so that they can go vote. After that, you need to surrender yourself to law enforcement for having violated both federal and state election law. No employer or his agent or a corporation shall print or authorize to be printed upon any pay envelopes any statements intended or calculated to influence the political action of his or its employees; or post or exhibit in the establishment or anywhere in or about the establishment any posters, placards, or hand bills containing any threat, notice, or information that if any particular candidate is elected or defeated work in the establishment will cease in whole or in part, or other threats expressed or implied, intended to influence the political opinions or votes of his or its employees. Adam Serwer at the American Prospect reports that Mr. Siegfried's actions may have violated federal law as well, although it will evolve on the interpretation of the effects of the letter. Siegfried's problems may be bigger than Ohio, however. Gerald Hebert, a former Acting Chief of the Voting Section of the Justice Department now with the Campaign Legal Center, said that it's possible Siegfried's actions may violate federal law. "Intimidating voters through physical or economic threats in connection with their registering to vote or voting in federal elections is a federal offense," Hebert says. "The questions presented by the McDonald's memo is whether he is telling employees they could lose benefits or their jobs if they don’t vote for the Republican candidates and whether they felt coerced by it." I certainly believe the employees were threatened and felt coerced by it. So much so that one of them felt it necessary to contact an attorney about it, which, I might add, was quite a courageous thing to do, and we all owe that employee a special gratitude for giving our democracy a fighting chance. What Mr. Siegfried did is unacceptable, and a half-baked apology is not nearly enough. He needs to atone, issue an apology to his employees and his customers, and feature campaign literature on the Democratic candidates as well (without taking sides, to provide information to his employees about the actual choices), as a way to make up for his voter intimidation, and he needs to pay the legal consequences. Until he does so, he needs to hear from us for the need to do so.